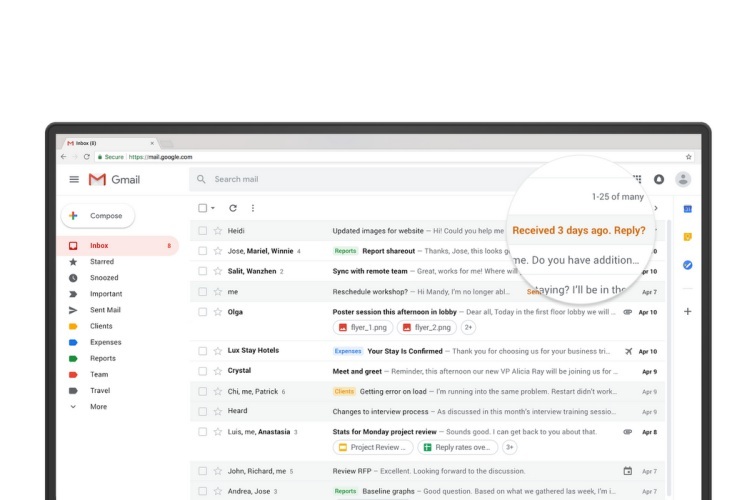 Google rolled out a complete redesign for Gmail late last month, coupled with a myriad of new features including an offline mode, confidential mode, and Smart Compose. But, one of these is a feature called ‘Nudge,’ which resurfaces old e-mails and reminds you to reply and follow-up with the recipients. The AI-powered Nudge feature started rolling out to users earlier this week and is enabled by default for those who have switched to the newer Gmail UI. However, it is possible that you don’t want Gmail to scan through your e-mails and judge whether it is important to nudge you about them. 1. Click on the ‘Settings’ cog at the top right of your inbox and navigate to the ‘Nudges’ section under the ‘Settings > General’ section. 2. If you don’t want to see e-mails that you’ve skipped over in your inbox or forgotten to respond then uncheck the ‘Suggest emails to reply to’ option. 3. But, you will need to uncheck the ‘Suggest emails to follow up on’ option to not see sent mails that haven’t received a reply yet. Now, if you completely want to get rid of the nudging feature – meaning you don’t want Gmail to show you any old emails at the top then you can uncheck both the options available under the ‘Nudge’ options in your Gmail Settings to turn off the feature. While Gmail’s nudging feature is quite a useful addition to this popular email service but the pop-up email notifications can get annoying for some, so you can now customize the same to best suit your needs.